You may recall, (if you are a *really* avid reader of our blog! ), that roughly a year ago we reported on an initiative that was being led by the two Sheffield universities, the Teaching Hospitals NHS Foundation Trust together with the region’s LEP and local authorities to “generate a refreshed and compelling long-term vision for our City Region”. 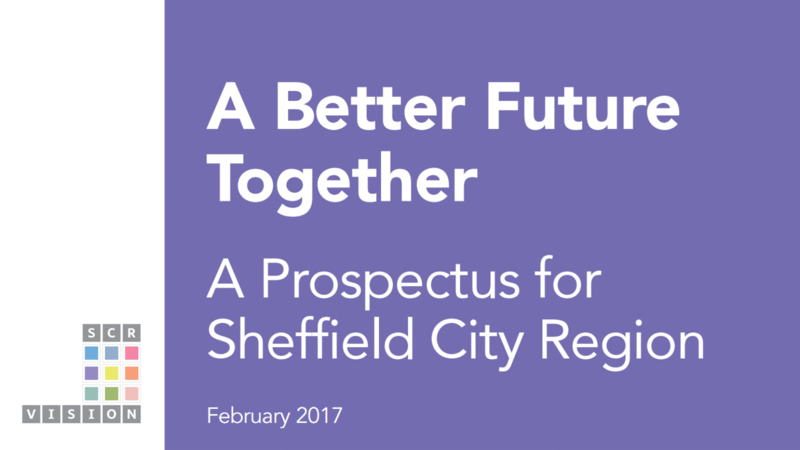 Well, this is the culmination of that effort, and I was at the launch event last Friday of what they have called “A Better Future Together: A Prospectus for Sheffield City Region”, and it presents a pretty interesting read. Here follows an overview, along with some commentary. Firstly, it’s good to have an articulation of a longer term view. The report’s intention is to look at the next 25 years and get a sense of how the region’s assets could be built upon for the future. We’ve had the Sheffield 2035 report a couple of years ago that took a similar look ahead, but this one is region-wide and a bit more focused in its scope. The two reports complement each other pretty well though, and if “A Better Future Together”, and it’s proposed programme of follow-on activity, does nothing more than regularly focus collective attention on the next generation’s future it will probably have rewarded the effort. Secondly, the report is mercifully short. Just 27 pages of concise and well structured exposition. The conclusions are perhaps not very surprising, at least for those who’ve been around local policy-making for a while, but the clarity and parsimony the report achieves is effective and well appreciated. The report next describes two key ambitions, and a number of targets to focus on in achieving those ambitions. To reduce deprivation by closing inequality gaps. To grow the number of local start-ups (growth target possibly as much as 50%). To grow local investment in research and development (growth target possibly as much as 50% in real terms). To grow the sector of our workforce classed as ‘highly skilled’ (growth target possibly as much as 30%). To improve public health, to bring life expectancy to above the national average. least 150,000 new homes) but also the condition of existing homes and the choice of size and tenure available to local residents. To continue to develop our environmental and sporting assets by extending and linking the green areas of the region into a ‘green network’. The renewal and improvement of our urban areas, particularly town and city centres, so as to make them more attractive destinations for residents and visitors alike. To improve the connectivity and capacity of our travel and digital connections both within and beyond the region. These are very brief excerpts, and I very much recommend reading the propositions associated with each programme. Finally, the prospectus discusses how progress should be made against each of these priorities. It counsels against leaving things to the public sector, but equally warns that relying on existing organisations risks the initiatives “retreat[ing] into institutional silos, ‘owned’ by organisations that inevitably have their own interests and to protect and pursue”. Sharing ideas, expertise and information. Spotting opportunities for working together. Promoting the opportunities in the region. Identifying and approaching potential investors in the region with investible propositions. Advising local government and other agencies on needs and priorities. In addition, the prospectus proposes the establishment of an independent advisory group – the SCR Guiding Coalition Group, along with a ‘dedicated resource to lead, support and facilitate the various programmes proposed and the work of the suggested Guiding Coalition Group’. And then pledges the support of the sponsoring organisations and invites other regional stakeholders to support the effort in whatever way is most appropriate to them. Some of my thoughts about this are personal, and some reflect the mission and interests of Sheffield Digital, so I will attempt to separate these out. Personally speaking, my immediate thoughts relate to the difficulty (some would say folly) of trying to prioritise things that will prove to be of importance several decades hence. Are these six themes really the most important to the next generation’s prosperity? Or might we, for instance, wish that we had more overtly championed social cohesion, not just the reduction of inequality? Or climate change mitigation, not just a ‘regional green network’? Or will all the work to digitise our industry and connect the region together just make us easier pickings for cybercriminals or state actors? The propensity of technological and social change to throw unforeseen surprises has a long history (in fact to a large degree it *is* history). So, while it’s no doubt useful to focus attention and activity on a small number of readily understandable areas in order to get traction, there is little indication of how the initiative will change over time to embrace new threats and opportunities, or identify and evaluate them. This is therefore not a radical proposition, it’s a consensual one. 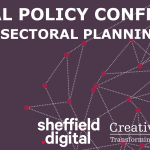 And then speaking with my Sheffield Digital director’s hat on, the main questions it poses are whether we should get involved in any of the Programme Alliances, and if so then which ones? What resources do we have to offer? How can we involve our membership and the wider community? And whether, beyond that, we should seek to become involved in the SCR Guiding Coalition Group. These determinations warrant much closer evaluation than I’m going to indulge in here, and will be discussed in detail by our board, of course. However there is one thing that I think is worth noting, and that is that digital technology, and therefore the local digital industries, have a role to play in all six of the programme areas presented. Teasing these connections out and applying them to the specific propositions in each area may be fodder for a future post. In the meantime, please let us know what you think of the report, and what support or involvement the local digital tech sector could offer. Either in the comments, by email, on Twitter or in the #-policy channel on Slack. You can find the report itself at the SCR Vision website. Chris is a co-founder and director of Sheffield Digital and a veteran of the Sheffield tech scene, having worked in digital project management and innovation at Technophobia for many years. Away from Sheffield Digital, Chris is a smart cities and digital innovations specialist working with clients and places across the country to develop their digital capabilities. Subscribe and get the latest news and information about Sheffield's digital sector straight to your inbox. Final episode of 2018 sees the team look back on a really positive year for the city's digital sector. 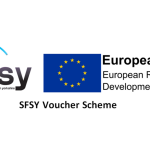 Sheffield is bidding for up to £100m to build a massive 5G Testbed connecting Sheffield and Rotherham city centres, and it needs your support! Copyright 2017 Sheffield Digital Limited. Company No: 9603846. VAT No: 237 2911 09. The Workstation, 15 Paternoster Row, Sheffield, S1 2BX.